The members of the Leftovers would like to thank all their fans for their continued support even though the band is no longer able to perform together because of health issues with two band members. We hope that you will continue to enjoy our music! You can also still hear guitarist D. Logan Foster with his current band FOB Sound Company. RadioIndy is pleased to present The Leftovers with a GrIndie Award for the CD "Reheat and Serve "
Classic power-trio rock driven by the kind of fiery and blistering guitar flourishes that defines the genre is the order of the day on The Leftovers fine new CD, “Reheat and Serve.” Alternately flashing the kind of licks a fan of Jimi Hendrix, Eric Clapton, or Stevie Ray Vaughan would drool over, veteran rocker D. Logan Foster leads a 3-piece band through a 9-song workout of blues fire and rock dynamics with drama and flair. With wife Cassandra Roxanne (Bass) and Bennie Bee (drums) proving a rock-solid and inventive rhythm section, classic blues rock gets a makeover on the Santana-inflected “Simple Woman” while the Southern chug of “Your Eyes Give You Away” are right out of the Lynyrd Skynyrd playbook. CD-opener, “Let’s Do It Again” surges with a Hendrix-like fury as Foster’s slashing chops cuts through the song like lightning bolts. But in the best of power-trio traditions (e.g., Cream, Hendrix Experience, Blue Cheer), sheer sonic power is often tempered in service of the song, as on the closer, “Mississippi Blues,” a blues shuffle that features Foster’s earthy and down-home vocals to best effect. 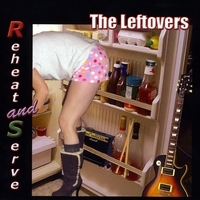 Classic by design and execution, The Leftovers CD, “Reheat and Serve” is anything but warmed-over: instead, it’s a vibrant and charged tasting of blues-rock that will always have a place on the classic rock menu. The Leftovers is on MySpace.com! MySpace page here and sample / purchase some great new music! The Leftovers Press Release on Digg.com! "Reheat and Serve" Reviewed by RadioIndy.com!